This contest is now closed. Congratulations to Mary Jo F for winning and please enjoy the recipe. Thanks! This is an old fashioned candy recipe that I’ve received a lot of requests for. Mama said her Mama Reed used to make it around the holidays for all the kids. Mama Reed had ten children herself, but was known for her hospitality and open table policy: If a meal was being served, you were welcome to come join them. 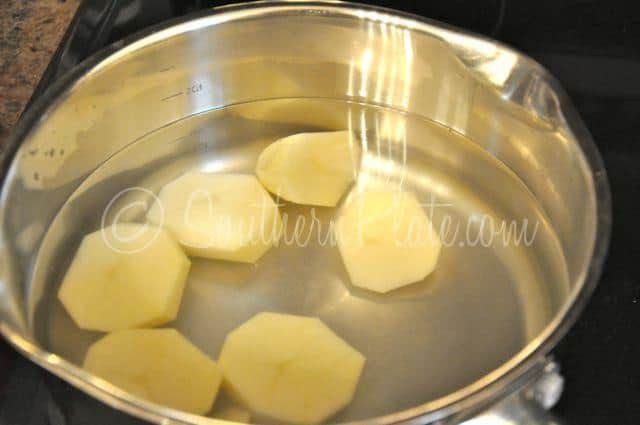 She made her potato candy a little different than how I’m making it here, but there are so many ways to customize this recipe that I’m sure you will be able to make it your own as well. Mama Reed liked to divide her dough into two batches, tinting one pink with red food coloring and leaving one white. She’d then pinch off bits of dough and roll it into balls, storing the balls into the refrigerator until ready to serve to the younguns or whatever guests happened by. I’ve also seen folks roll out little balls of potato candy and dip them into melted chocolate to serve as a sort of poor man’s bon bon. Either way is delicious. Now if you’re thinking potato candy sounds weird, I can see where you’re coming from so I’m gonna let you know what to expect : Old Fashioned Candy Heaven. This candy is kinda in the same taste category as Fudge or Divinity. It is just that good! You won’t be disappointed! The ingredients for this are simple ones, my favorite kind! 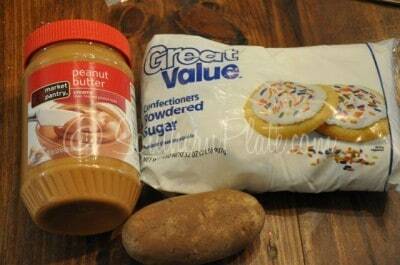 Peanut butter, confectioner’s sugar, and a potato. You can add a teaspoon of vanilla if you like, but you don’t have to. Y’all know I like things as simple as possible. You can also leave the peanut butter out and just roll it into balls like Mama Reed did, but oh my goodness, I love the peanut butter! You could also use nutella or a soy butter or such if you need to substitute. Peel and slice your potato and cover it with water. bring to a boil and cook until tender. Drain your potato water and place the cooked potato in a mixing bowl. Beat it up real good. 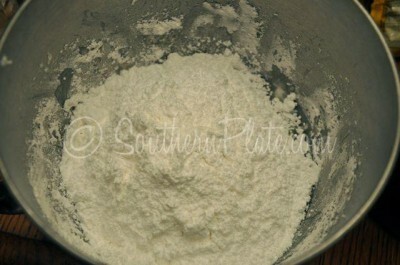 Add about half of your confectioner’s sugar and mix it up well again. Until you have a pulpy, liquidy, mess. Dump in the rest of your sugar. Sure you can add it “gradually” if you have all day but it’s just as good to dump it all in there and get on with making some candy. 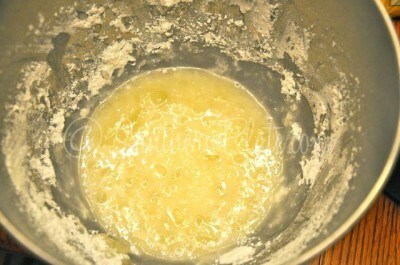 After that second mixing, you’ll have yourself a good stiff dough, like the consistency of cookie dough, only maybe a wee bit stiffer. 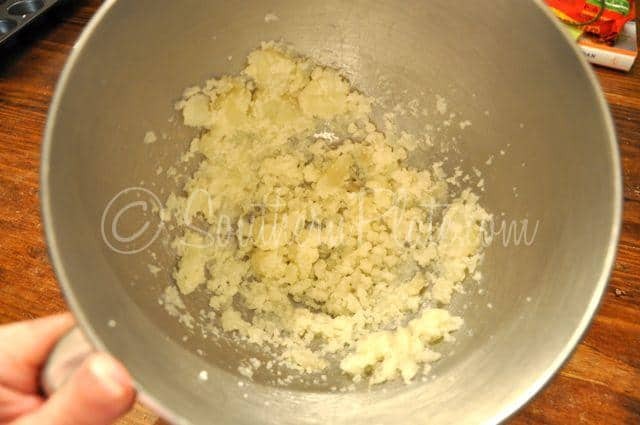 You may need to add a little more sugar, depending on the size of your potato, to get this stiff consistency. 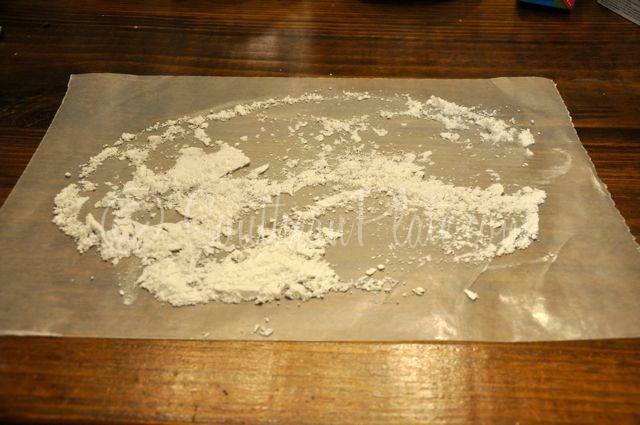 place a big old sheet of waxed paper on your countertop. If anyone is feeling particularly technical today, I think this is like…18 inches long – ish. *I have a strict policy against unnecessary math in my life so go with an estimate here. Put some confectioner’s sugar on that to keep your dough from sticking like tar. 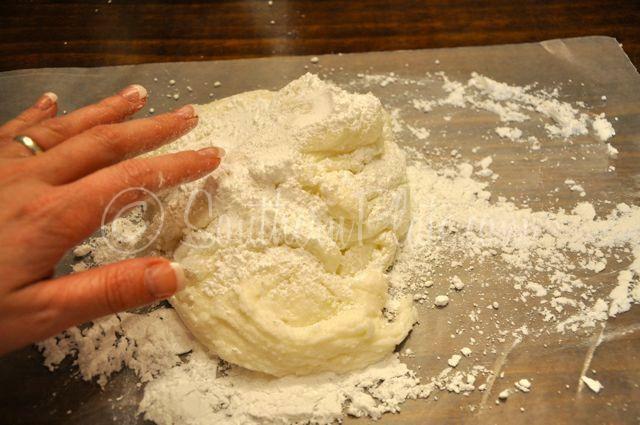 Dump your blob of dough on that. You’ll have to scrape down the sides a bit to get it all. Dust the top with some more sugar. Okay, I didn’t dust, I just put a handful on there but sometimes I worry that y’all will think I have no grace at all so I throw out dainty little words like “dust”. While I was typing this I was drinking iced tea at the same time and just to help emphasize my supposed daintiness, I lifted my pinky as I held the glass. Okay, I’m over that now. Roll that out until it is about a quarter of an inch. ~tilts her head sideways and squints one eye~ Hold your head like this and it will look like a more even-ish blob. Smear some peanut butter on that. I have no idea how much peanut butter you’ll need so just go with your gut here. You can do this because you are awesome! Now roll that up log style, like you’re rolling up cinnamon rolls. Now since we have the waxed paper already out there anyway, roll your log up in your waxed paper. To make life easier, I cut my roll in half. Then they will both fit in a gallon zipper bag. Place this in the fridge until thoroughly chilled. When ready to serve, remove waxed paper and slice into inch slices. Makes about forty pieces of candy. Peel and slice potato. 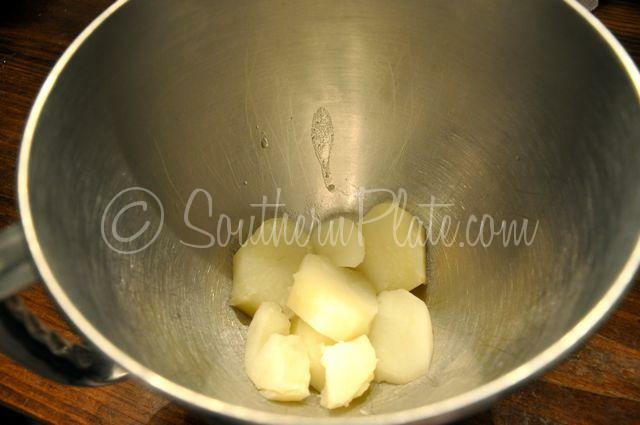 In small sauce pot, cover potato slices with water and cook over medium heat until soft. 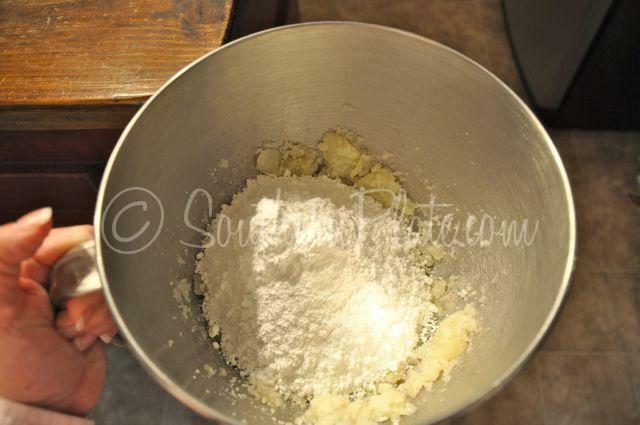 Drain potato and place in mixing bowl. Beat until mashed. Add ½ sugar and mix well. Mix in remaining sugar, scraping down sides as needed. Line a countertop with a sheet of waxed paper dusted with confectioner's sugar. 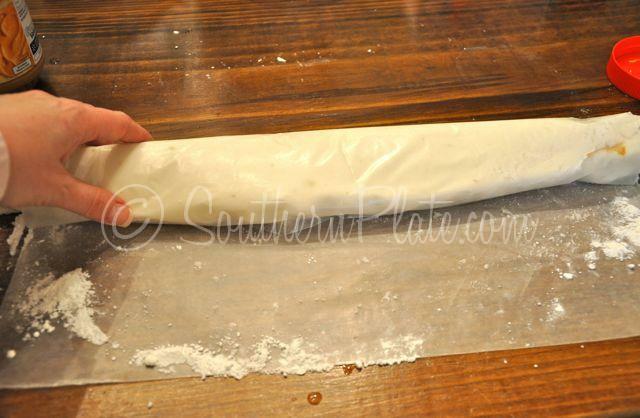 Scrape out dough onto waxed paper and dust top with more confectioner's sugar. 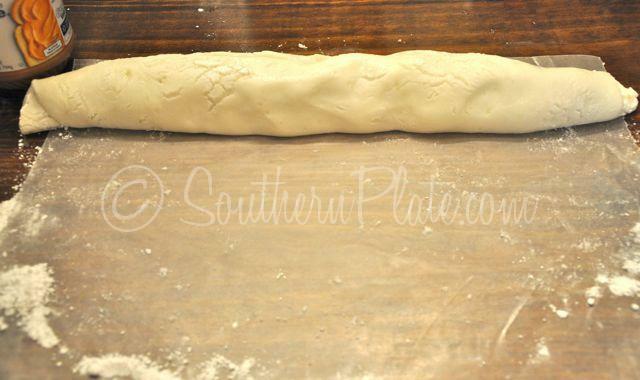 Roll out to a thickness of about ¼ of an inch (don't go getting a ruler here, just eyeball it. This isn't rocket science). Spread dough with peanut butter and roll up like you are making cinnamon rolls. Once you have rolled up into a log, roll log up in your waxed paper and cut in half. 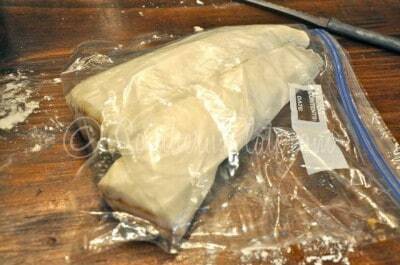 Place halves in a gallon zipper seal bag and store in the fridge until ready to serve. When ready to serve remove waxed paper an slice into ¼ inch slices. Store leftovers in the refrigerator. This post is part of the Nestle Family Holiday Exchange, which means one person who comments will win a great prize pack courtesy of the Nestle Family. Today’s prize pack is a Baking Package, great for a fun evening of baking with your family! $25.00 Visa gift card to cover other baking supplies. This contest closes at midnight, Thursday December 9th. Winner will be notified by email and announced on this post Friday December 10. Please note that I will be out of town during this time for my Friday appearance on The 700 Club so the winner will not be announced until late Friday night. To enter, leave a comment below sharing your favorite holiday recipe (you can just tell me the title of the recipe or include the whole thing if you like!). 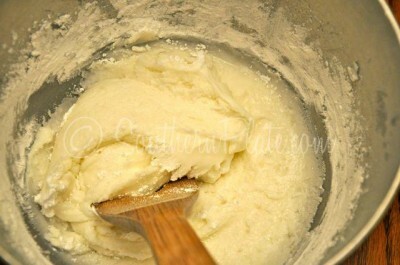 You can also visit Nestlefamily.com and tell me a recipe there you’d like to make this year. Check out the Very Merry Cookie Wreath idea while you’re there! Disclaimer: I have partnered with Nestle Family to be a part of this holiday exchange series of posts. I have not been paid for a positive opinion and all opinions expressed in this post are my own. I LOVE Potato Candy! My Grannies always made it with Peanut Butter so that is the only way I have ever made it. Never thought about there being different ways. I have never tried potato candy, but after seeing this post I think I will make some. 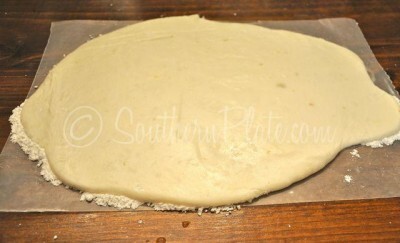 Thanks for all the great ideas, I LOVE Southern Plate. 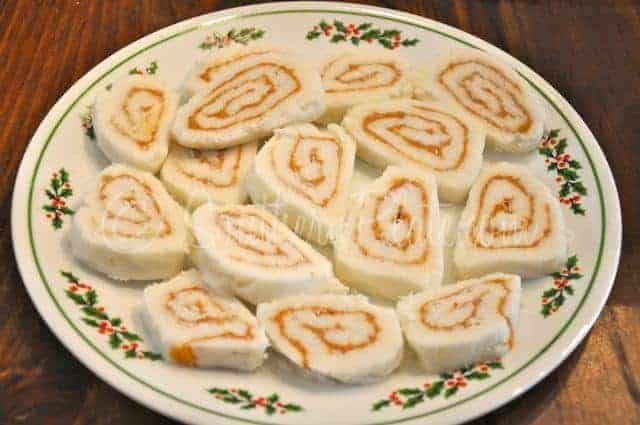 My mother-in-law used to make a candy that was a sort of divinity that she would pat out into a rectangle on a tea towel sprinkled with powdered sugar. She would then spread peanut butter over the divinity, roll it and slice it. While I make a great divinity, I’ve never tried the rolling and slicing part. Maybe I’ll make this for my family and see how it compares. This is the same way my Granny made it! So simple, yet so good! Chex Mix is probably my favorite holiday snacking item, not only b/c of the taste but because of the memories associated with the person who gave me the recipe. 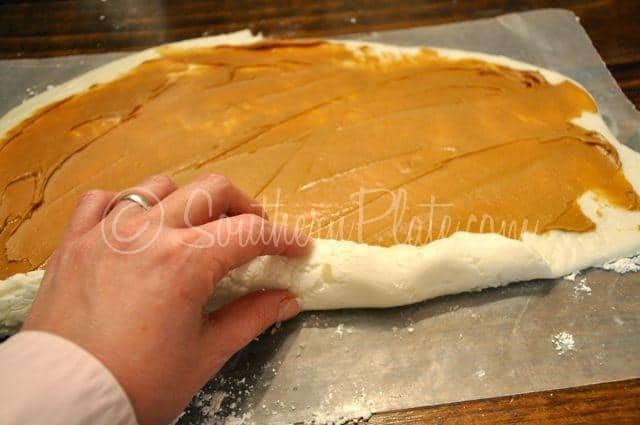 We make potato candy with peanut butter and with jelly…We always have homemade jelly on hand, so it’s such a nice treat! I just started making potato cand two years ago and we LOVE it !! I like to use the peanut butter with honey …just to add a touch of sweetness. But my all time favorite candy is the Buckeye !! 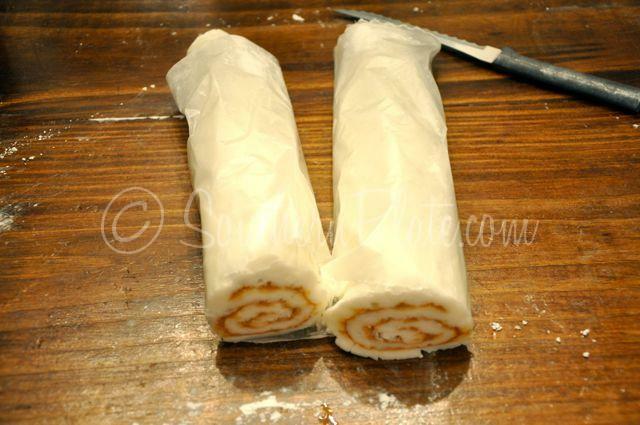 Potato candy with a big cold glass of milk… mmmm! I’ve never eaten this but I’m sure going to try it.! Thanks for sharing!!!! My grandmother use to make this, it was her favorite. I myself am not a big candy person. I do like to make sausage balls every year though. My family loves them. We like “puppy” chow–you know that cereal/peanut butter/confection sugar stuff. I also love this potato candy. I always use leftover mashed potatoes to make it. 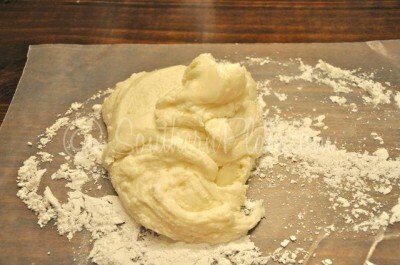 I did break a hand mixer once making it though–that dough is STIFF! Wow–I haven’t thought about potato candy in maybe 40 years. My mother would make it for us if she happened to have leftover mashed potatoes when we were young (my folks didn’t have much money when their kids were little, but potatoes, powdered sugar and peanut butter were always on hand). It’s also a recipe my momma got from her momma–who’d raised 9 kids with so little it shocks me now to think about it. Thanks for sharing this, Christy–I’ll make some this holiday season and share the family memories that go with it with my own children, who’ve never tasted potato candy. we always made this but with no potato. 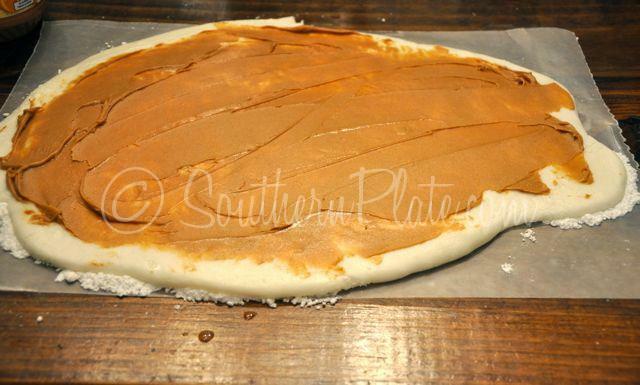 We called it peanut butter pinwheels. so good! I have never heard of potato candy before. I’ll have to call Ma and ask her about it. I’m sure she’s heard of it, if not made it at some point. My favorite recipe this time of year is definitely the candy ones. I love making homemade chocolates for my family & friends. I also love homemade cinnamon rolls & make them quite often so they’re not just a holiday specialty. Gotta try this!!! Never heard of it before, but I never saw a potato I didn’t like, so…hmmm….think I’ll try Nutella instead of peanut butter in a batch. you just never know whats gonna show up on this blog! cant WAIT to try this! Oh my goodness! I love that candy…hadn’t had it in years! I think my Grandmother used to make it, and I had no idea it was made with potatoes until now!!! Thank you, Christy!!! 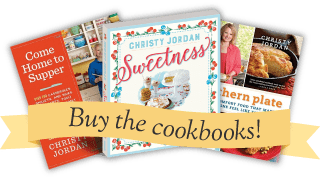 My favorite holiday recipe….wow, how to choose? Pumpkin pie has to be one of my favorites! I have never heard of potato candy…..I may just have to give it a shot! I love Divinity! WoW!!!! I haven’t seen any potato candy is such a long time. I’m going to make some right now. Oh! Wait, I have to go to the store first. I need to get the sugar. Thanks for reuniting me with a taste of my youth. My favorite treat that I get every year from my Dad is a cookie called “Lizzies’. I don’t know where the name came from but they are a “fruitcake-like” cookie. My grandmother on my Dad’s side made them every year. What’s funny is that you can’t pay anyone in my family to eat fruitcake but we will eat our weight in Lizzies. They’re just a little different, I guess. It isn’t Christmas until I get my box of Lizzies from my Dad. Love this recipe! Just like one of the other posters, I’ve made this too but without the potato it’s one of my all time favorites! My dad has been making home made chocolate chip cookies since I can remember and that has to be one of my Christmas favorites. He always make a huge batch of cookies and Fudge about 2-3 weeks before Christmas time and sends them too all of his kids and keeps some around the house for when we visit! Love them! Hi Christy! I’ve never heard of potato candy but you bet I will be giving it a try. It looks fabulous. My favorite holiday recipe is frosted sugar cookies. Holiday time is about the only time I make them. I remember making them with my mom and it’s a tradition I’ve passed down to my daughter. I can’t wait to try this. I will wait until my kids try it before telling them it’s made with a potato. My mom is the candy maker. She makes the coconut candy with Marachinno cherries dipped in chocolate. Yummy. My friend mAkes an awesome cornflake candy with peanut butter. I will have to get the recipe for ya if you can’t find it. Let me know. My Grams always made potato candy. 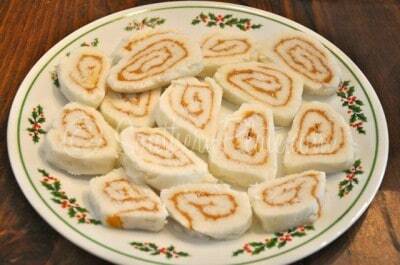 That and her Date Roll are my favorite Christmas candies. I have made potato candy all my 78 years but never thought about rolling it in chocolate what a great idea. You know what works well also is mix crunchy peanut butter into a small ball of left over cream potatoes thicken with confectioners sugar then roll into the chocolate. Just another way to use left over potatoes. i remember my mom making a kind of potato candy with coconut added to it, then dipped in melted dark chocolate. Gonna try this…looks pretty good too.